Design House Stockholm's 'Work Lamp' is a modern take on the classic utilitarian work light. With a design that is so perfect and so simple it is a perfect light fixture for any space. 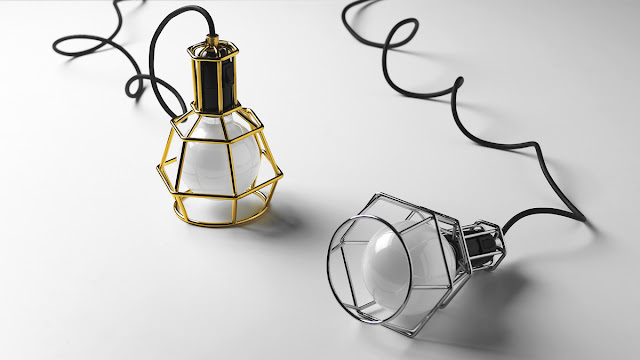 The Work Lamp by Design House Stockholm is made with a thicker wire, improved angles, and more of a long-lasting appearance. Gold and chrome plating adds character to this ready-made design lamp, while the form and readiness preserve its blue-collar roots. "One lamp to rule them all", joke Jonas Pettersson & John Löfgren and Petrus Palmér who together constitute the acclaimed young design trio 'Form Us With Love'. "We wanted to make a lamp using as little material as possible. The traditional construction lamp was already there: you can drop it, treat it roughly, it's an everyday do-it-all object. We just had to give it a better appearance!"